The sky in front of us was crowded with angry, dark clouds. The kind that only a summer storm can produce. Clouds so low, the green tops of the surrounding pine forest threatened to skewer them as they waddled towards us. In another half mile, we would be in the thick of this storm and the only thing separating us from the asphalt was a half inch of rubber. Deep breath. Now add up the positives. A passing photographer caught Mark Kelly leading the group through the storm. He’s in white at the front, I’m to his right behind, third one back. There was no lightning, the rain would cool us off, most of us had lights and it was a Sunday morning in July, near Givhans Ferry, SC, so traffic was practically non-existent. I slipped to the outside and asked everyone to give themselves just a bit more room then tucked back in and waited. Then I reminded myself that a year ago I could barely walk, and I had much to be grateful for. The darkness grew closer and the rain was so thick it resembled a grey curtain hanging in front of us. Well…we only had about 40 miles to go before we reached Charleston, the rain wouldn’t last forever, and Mark Kelly was on my right shoulder. 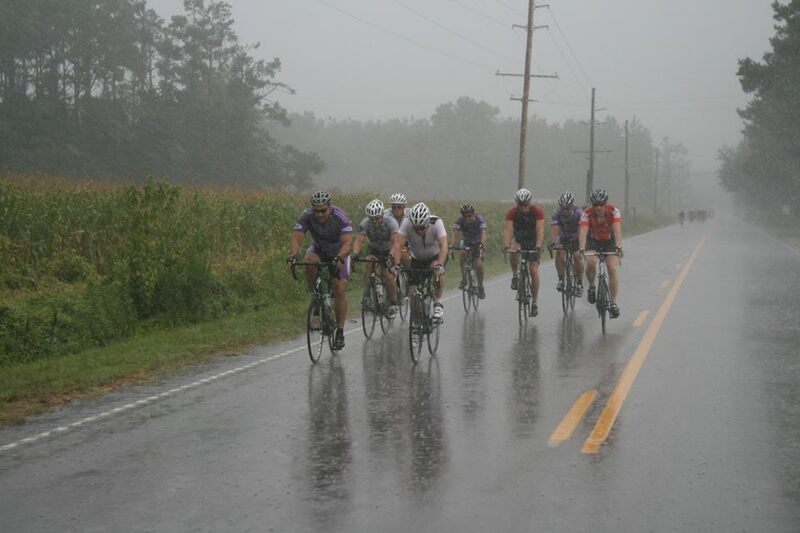 If I had to pedal through this Carolina downpour, Mark’s the guy I want next to me. Since my return to cycling in 2014, I’ve spent a lot of time on the road with Mark and I’ve enjoyed every one of those miles. Cycling is an amazing way to spend a pretty day and we happen to live in a very beautiful part of the country with a vibrant cycling community. Cycling is also about suffering. There’s hills and mountains to climb, faster riders to try and stay with, and goals to achieve. My racing days are well behind me but that doesn’t mean I don’t want to push myself. And in 2014 when I asked Mark Kelly to join myself and Bill Englert in the Ride to Remember, I was hoping he would push me. In the three or four months we had to get ready, we got to know each other on a deeper level and our friendship grew as strong as our legs. While riding, Mark is the guy that forced me to go just a bit faster, climb a bit harder, push myself a bit longer. And when we lined up for that first Ride to Remember, even though I didn’t feel ready to ride across the state, Mark convinced me that I was. 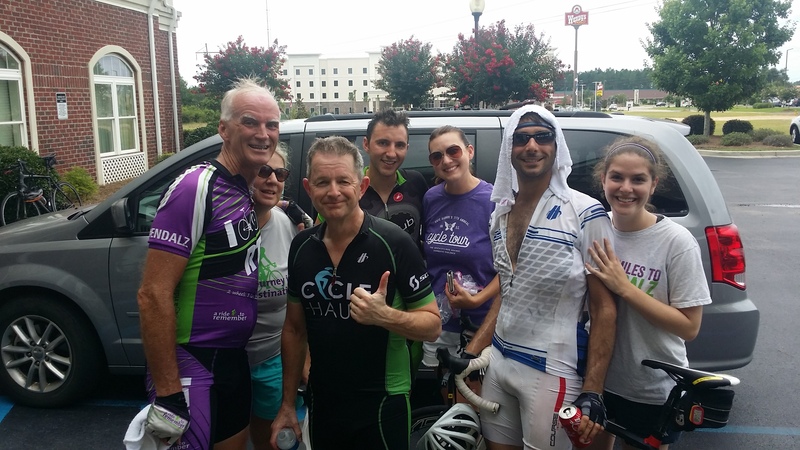 Brian Hale, Mark, Bill, me, Emily Banks, and Kate Plumer at the start of the 2014 Ride to Remember. We called ourselves the Coast Busters and at this point we had each raised an average of $1800.00 for the SC Alzheimer’s Association. 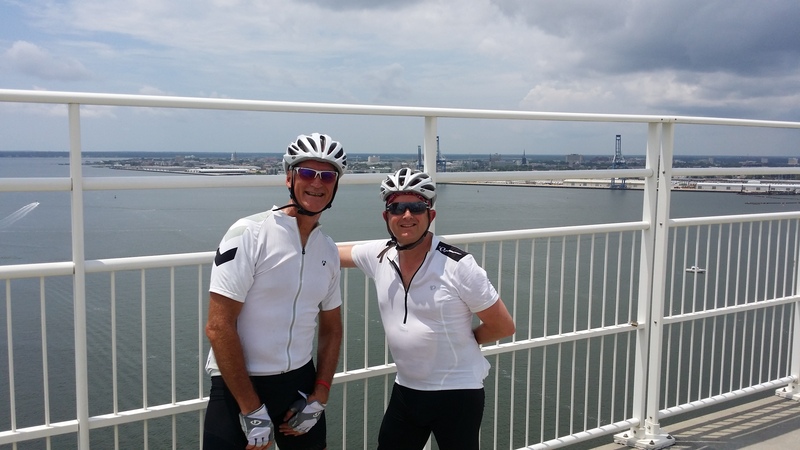 Three days and 250 miles later, we crossed the Ravenel Bridge into Mount Pleasant and stopped at the top for a photo. A lady that was jogging past asked us if she could help and when Mark handed her the phone, she asked us where we had ridden from. She raised one eyebrow with a look of disbelief. “Oh isn’t that nice.” She handed the phone back and quickly jogged off, convinced she was in the company of two delirious drifters. 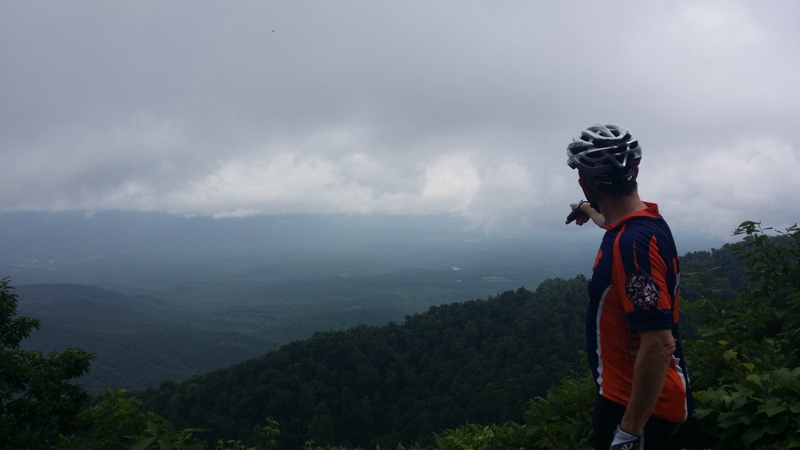 Mile 251 of the 2014 SC Ride to Remember. With Mark Kelly at the top of the Ravenel Bridge. In the last three years we’ve shared a lot of miles and sweat. We’ve marveled at God’s hand in creating the Upstate of South Carolina, and treated each other to espressos and the occasional doughnut or cinnamon roll. And wouldn’t you know, he’s usually been faster than me. At the top of Skyuka, we spent a few minutes enjoying the San Francisco style fog. His enthusiasm for the ride, even though our view was obscured, was unabated. Mark Kelly at the top of Skyuka Mountain looking down at the Green River valley. Looking back, I wish now I would’ve been able to stay with him. That would’ve given me a few more minutes in his company and perhaps another memory to share and cherish. Last week Mark told me he’s moving to Washington, DC. He’s a professional whose knowledge is highly sought after in the higher education field and he’s been presented with a significant opportunity to share that knowledge with a broader audience. I’m happy for him and his wife and if I were in his shoes, I would’ve made the same decision. That doesn’t make parting any easier. After the shock of the news wore off, we made small talk about how much we both love DC and that it’s only a short plane ride away. 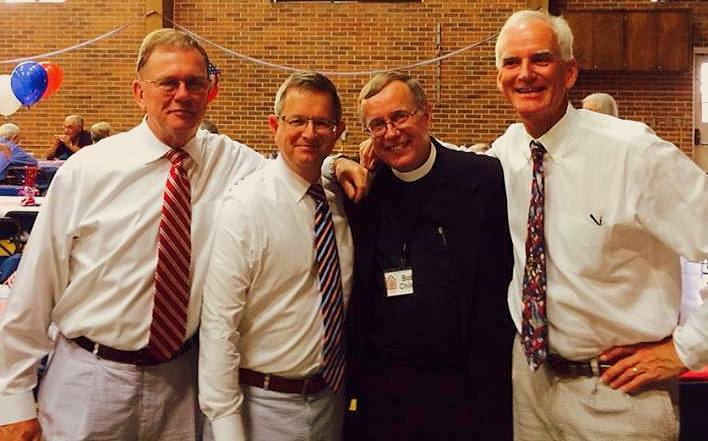 And how much he and his wife love Greenville and naturally they’ll return as often as possible to visit friends. In that moment I saw us on the road, three years prior, shoulder to shoulder, facing a torrential downpour and he’s there to provide a few calm words of reassurance. Life is dynamic. We learn, we grow, we live and love and in so doing we’re often presented with opportunities. And in those moments we either press on, or we pull over. Perhaps to seek shelter, perhaps to wait out the metaphorical storm. Mark is the guy that presses on. Because on the other side of that storm we were greeted with sunshine and a gorgeous Carolina sky. And now Mark has an opportunity to press through a storm of change and he’s moving forward. Damn. I’m really going to miss him. My rides won’t be the same because every time I look over my shoulder, I’ll look for his confident shadow and his calm presence. Godspeed and keep the rubber side down, my friend.